Based at Frankfort, Michigan, offering soaring flights over the dunes and bluffs of Lake Michigan. National Soaring Museum Landmark Site. On line store of Soaring Books and Supplies. Featuring top selling 'Made Easy' series by Bob Wander, and many other essential soaring titles and supplies. RC soaring events, results, and pictures. Personal reflections on soaring and skydiving clubs in Victoria, Australia. Some snippets on archaeology and permaculture. A large number of texts from the Deviants and Trepan lists, alt.shenanigans, news.admin.net-abuse.misc and quite possibly many other sources. A full service commercial soaring operation offering instruction, glider rentals, and demonstration rides, as well as prices. Commercial site 20mi. east of Palmdale, Ca. Wave and ridge soaring, Big thermals to oxygen altitudes in the summer. Thermals in the summer, wave during the winter. Commercial operation offering year-round Soaring from California City Airport, 2 hours North of Los Angeles. Located twenty-five miles north of Reno, in the high desert of Nevada. Summer soaring is superb, with cloud bases reaching to 18,000 feet. Pilots and certified instructors flying sailplanes and offering instruction at Saratoga County Airport. Provides membership, weather, and general soaring information. Mike Shellims page, includes hardware and soaring related software reviews, details on various projects, white papers, articles on safety matters, and reports from events. A point of contact for RC soaring on Maui, including photos, chat room, and links to clubs and resources. Arizona Soaring operates from Estrella Sailport, a private airport south of Phoenix with a fleet of 15 sailplanes and FAA instructors. Spectacular soaring over Oregon. We offer lessons and rides from March through November. Located in McMinnville Airport, Oregon. Covers soaring in the Western US, Utah and Colorado. Soaring in full size gliders and with Radio Controlled models. Youll find information on local activities, articles, pictures and links. Soaring Association located in Southern Ontario. Most active club in Canada, we offer introductory flights and flight training. The Waikerie International Soaring Centre is the clubs commercial operation, which offers crosscountry soaring, aircraft, accommodations, training, and a maintenance facility. A resource for slope soaring with an extensive list of slope soaring sites. FAQ version 1.04, list of books, audio-visual materials, patents, the OSTIV conference proceedings index, the Technical Soaring index (incomplete), serials, and flight test evaluation reports in any language. Site for the soaring SIG of the Valley Forge Signal Seekers R/C flying club. A soaring club based on Lillo airfield, Toledo, Spain. Host place for soaring of Wold Air Games (WAG2001). Flight school with SZD-50-3 Puchacz double seat gliders. If the business hours of TOSS in may vary on holidays like Valentine’s Day, Washington’s Birthday, St. Patrick’s Day, Easter, Easter eve and Mother’s day. We display standard opening hours and price ranges in our profile site. We recommend to check out toss.freeservers.com/ for further information. 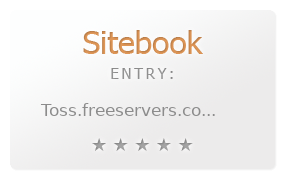 You can also search for Alternatives for toss.freeservers.com/ on our Review Site Sitebook.org All trademarks are the property of their respective owners. If we should delete this entry, please send us a short E-Mail.